We have a lot of slugs in our garden. 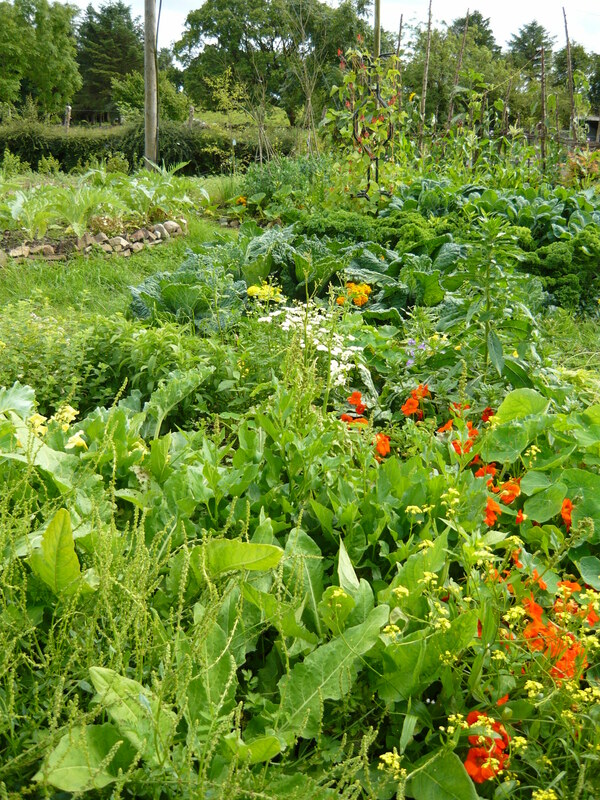 It is a problem as annual vegetables and flowers tend to be attacked when they are small. We still like to grow them, but we also decided early on to go down the perennial route as well. We do have a lot of Nettles, Dandelions and Chickweed growing wild in the garden and like to cook with all of them. Good King Henry, Turkish Rocket and Wild garlic have been added to our collection of perennial vegetables. They are reliable and tasty and because they grow in abundance, very hard for the slugs to eradicate. We also like pretty flowers and sometimes they go hand in hand with food production. The Daylily, Hemerocallis is a popular perennial that grows in gardens everywhere. 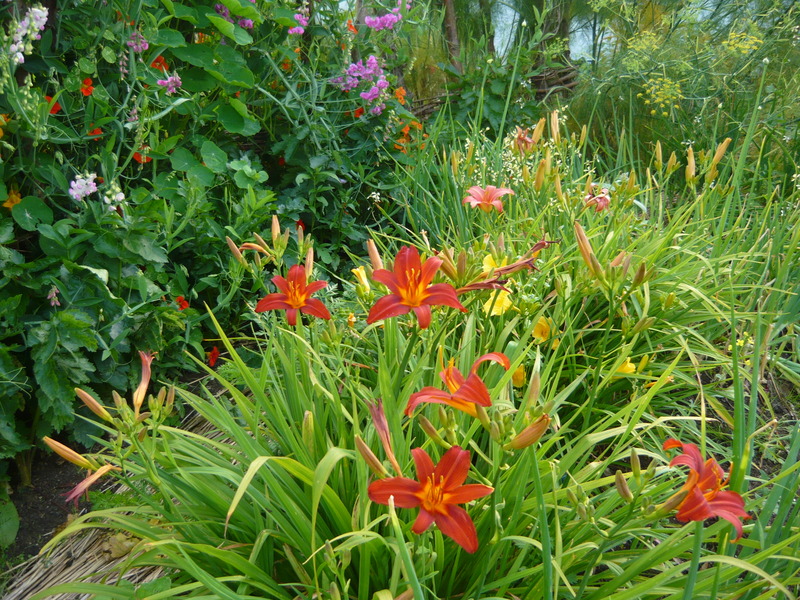 Many Daylilies are edible and have been used throughout China and other parts of Asia for a very long time. We love to eat them, both in salads and stir fries. 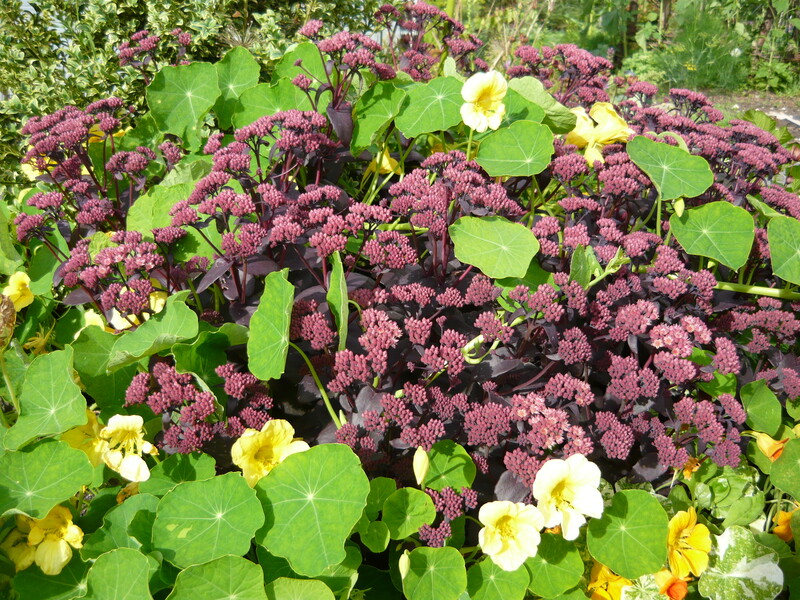 Another reliable salad plant is the Ice Plant, Sedum Spectabile, that has succulent leaves, very tasty in a mixed salad. This is a purple variety along with some Nasturtiums. 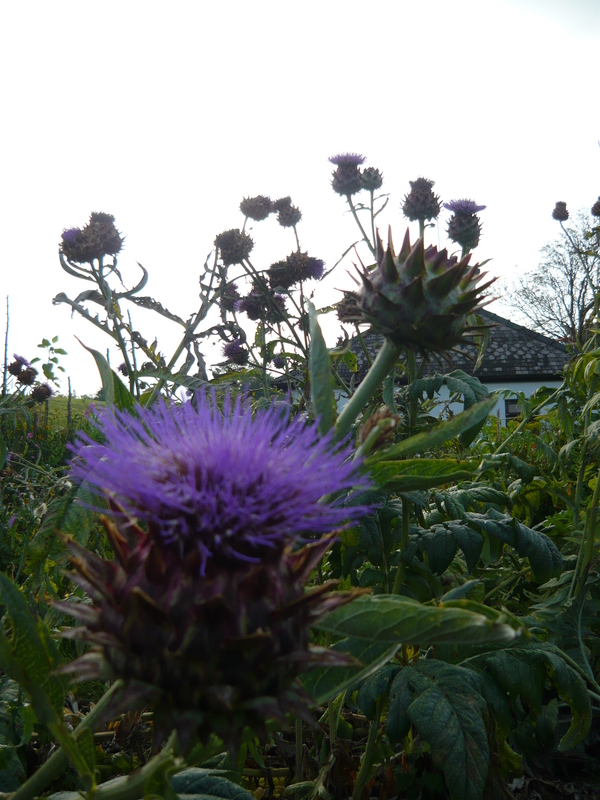 Cardoons and Artichokes bring great beauty as well as taste to the vegetable garden. 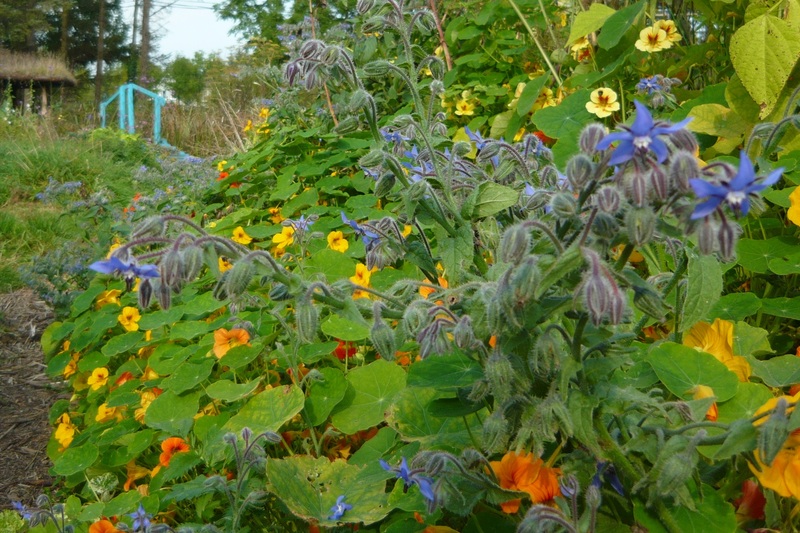 We can not exclude the Sunflowers, Nasturtiums and Borage, although they are annuals, they like to seed themselves around the place and can all be eaten as well as provide floral beauty and food for beneficial insects. It is in fact easy to create a vegetable garden full of edible flowers. We like to incorporate as many flowers as possible in our annual vegetable patch as it confuses some pests and add a lot of joy as well as taste. It is a lot of fun but please make sure you know exactly what you are growing and eating to avoid any toxic plants. 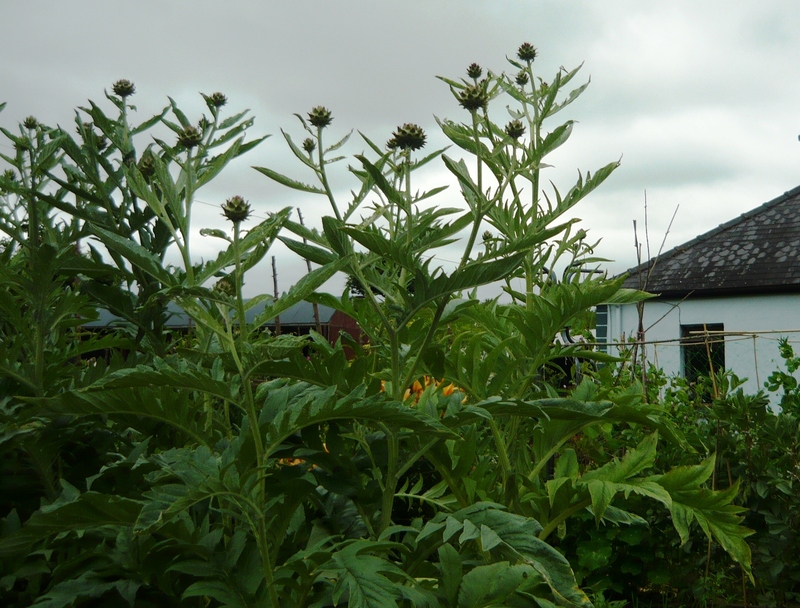 Creating a Forest Garden: Working with nature to grow edible crops. By Martin Crawford. ← A living willow fence. Thanks for the fascinating info Maria,a really good (is it called a ) blog. Do you need boundless energy and a reliable back to achieve all this or can anyone do it ? Hello Michael, the good thing about the perennial vegetables is that you only need to put them in once and then they more or less look after themselves. You do need quite a lot of energy doing this but if you get rid of your telly, you will find you have time to just potter about and gets lots done. The most important thing is to do a little every day and don’t wear yourself out. It is also a good idea to work with friends. They might help you out and then you help them out in return. It makes it more fun as well. Your garden sure looks pretty. Are you West coast? Thank you. Yes, we are on the Roscommon Mayo border. Where about are you? We are Roscommon, Leitrim, Sligo border ! A beautiful part of the world eh? Yes, very beautiful. We are not far from you, county Sligo is just a few miles from us. We are just outside Ballaghaderreen.